Exhibition: 23rd – 31st August. Unit 3 ASC Studios, Empson Street, London E3 3LT United Kingdom. 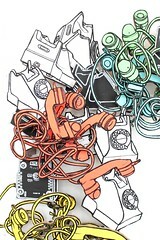 One piece of my work is at the show, “Synaesthesia”, which shows a telephone broken drawn in different colours in a confused explosion and tangle of handsets and receivers.